I find myself unable to explain properly my fascination with today’s customary hotel selection and decision process that is based solely on on-line traveler reviews. Unquestionably it has improved immensely the travel experience for most of us, as all it takes is a glance at the number of stars and the first half-dozen reviews to get a pretty good idea of an abode. One-and-a-half stars and quotes like “rat-infested,” “dingy,” “I’ve slept in better toilets,” and “popular with the Hells Angels crowd,” and that guesthouse’s Internet revenues will plummet precipitously like the Chinese stock market. Likewise, endless oozing, glowing reviews such as, “amazing value,” “close to all the major attractions,” and, “Roger the waiter couldn’t have been friendlier,” compels one to confirm the booking. 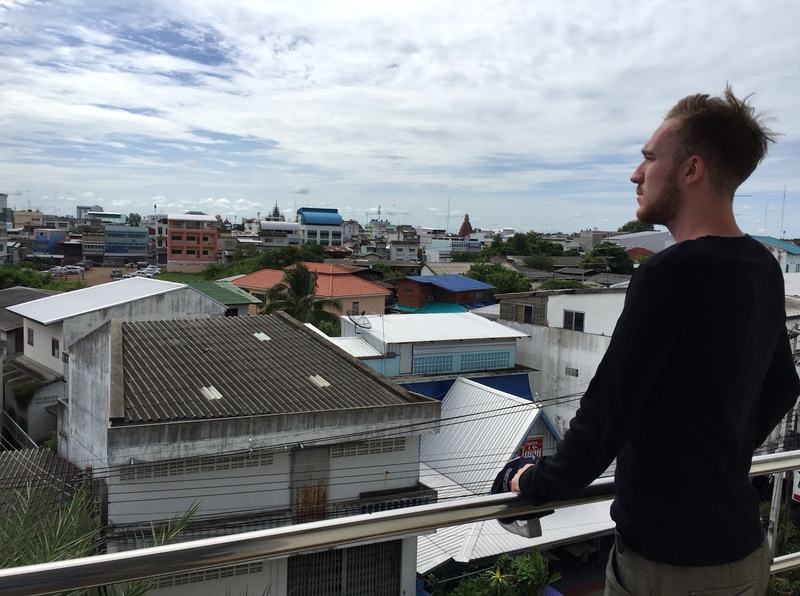 So it was with an ongoing keen sense of interest when I recently wanted to book a hotel for myself and my first-cousin-once-removed in Surin, Thailand, for a one-night stopover on a roadtrip from Laos to Cambodia. One singular lonely property, the Maneerote, popped up on the main online search sites, which teased me with an abundance of hotel filtering options. At first glance the reviews for this solitary hotel in North East Thailand seemed favorable and the rooms cost $12. My initial reaction was to keep searching, as it was surely some form of youth hostel at that price. But alas, nothing else showed as available during my extensive three-minute twenty-five-keystroke research undertaking. So I booked two rooms at the Maneerote at $12 a piece. I could’ve shared with the first-cousin-once-removed, but he can be a finicky room companion, so I thought why not splurge here. 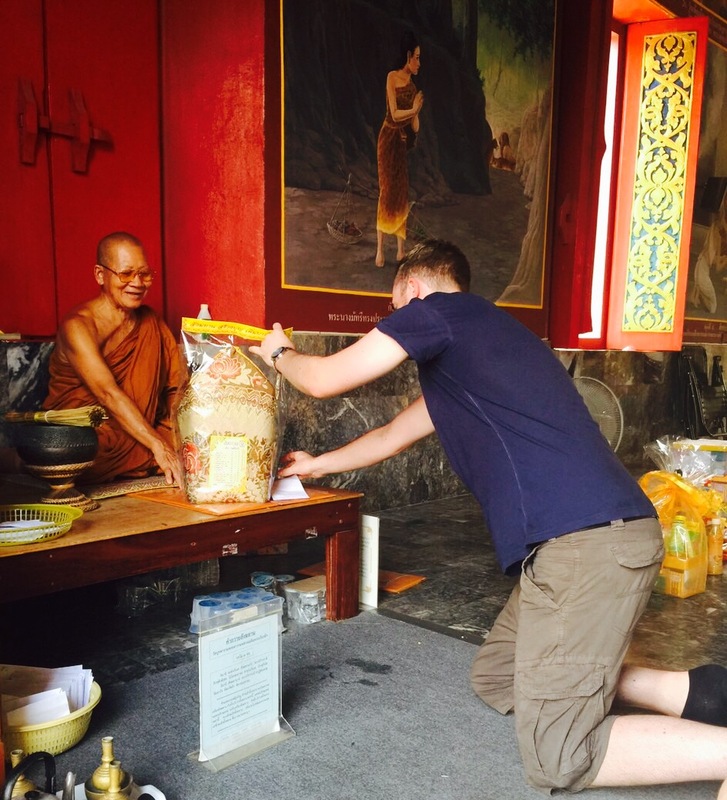 My first-cousin-once-removed offers gift to monk in nearby Surin temple. Arriving at the hotel though the busy, bustling town of Surin, I was impressed to find that it was not located on some remote industrial estate where they shot the invasion scenes from the Terminator movie franchise. Furthermore I thought, it actually looked pretty nice, was close to the thoroughfare and one of the main temples, and had an adjacent comfortable looking coffee shop-come-café. Decently dressed, smiling helpful folks worked at reception, the elevator worked, and behold, the rooms were nice, clean and with wraparound balconies offering decent views of the entertaining town of Surin. What a deal I reflected, we should be paying more. Leaving the next morning my first-cousin-once-removed and I couldn’t identify a single aspect of the Surin Maneerote hotel experience that could be impugned, even at a much higher price. Splendid view of Surin from the Maneerote Hotel $12 room’s balcony. For all of the above traits the hotel shall receive nothing less than the highest possible rating from each of us. Even in altruistic dedication to my on-line reviewer’s badge pledge of allegiance, how can I possibly deduct points when it cost less than I used to spend on youth hostels in Europe over 30 years ago? And here, in our comfortable separate rooms at the Hotel Maneerote, we don’t have communal bathrooms or showers, nor do we have to tolerate Germans snoring in the top bunks or the wandering waft of well-traveled socks. The Maneerote hotel, what an absolute bargain! 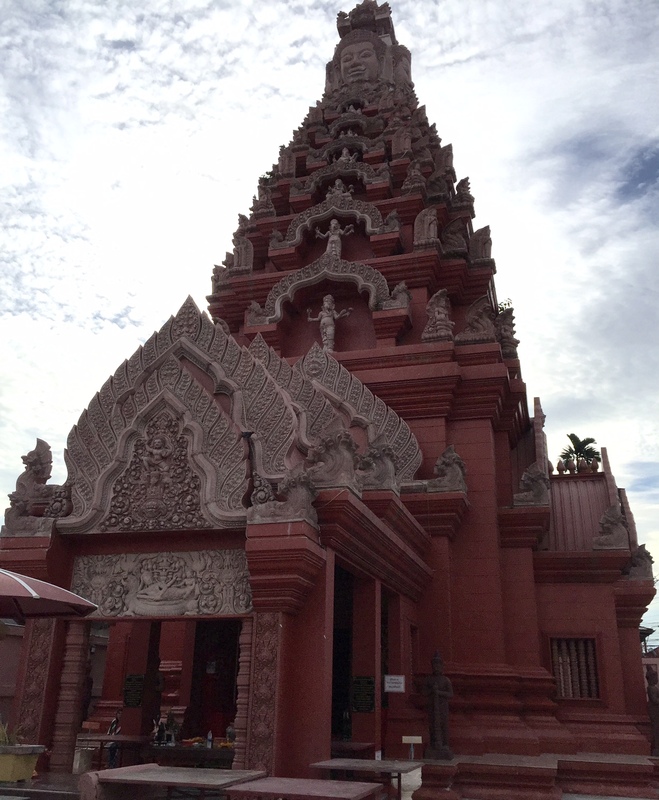 Nearby Khmer-style temple in Surin, within walking distance of the $12 Maneerote Hotel. This entry was posted in Travel Review and tagged first cousin once removed, hotel, maneerote, surin, thailand. Bookmark the permalink.